now available here at Lakes of Wood. 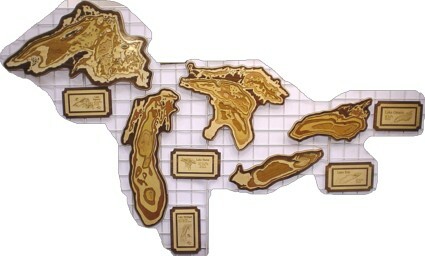 We also have created a ten piece set (Superior, Michigan, Huron, Erie, and Ontario and an Information Plaque for each) of the Great Lakes in scale to each other. Each will be signed and numbered on the back. and order your favorite Great Lake! 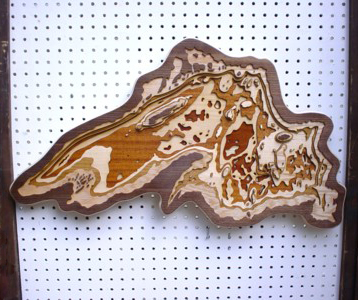 All five of the GREAT LAKES are made up of 8 layers of mixed hardwood veneer 1/8" plywoods. Minwax Natural Wood Sealer is used to preserve and highlight the woods' natural colors and grain, before each Great Lake of Wood is sprayed with two coats of laquer, hand sanding each level between coats. Lake Michigan, shown in the accompanying photos is 31" high, and about 13" wide, (if placed in a rectangle). Lake Superior (third picture down) is 31 " wide and nearly 16" tall! The Lake Michigan Name Plaque, (included with each Great Lake of Wood) is 10" high, by 6" wide, and gives lake depth information, surface area, and indigenous fish species info. Lake Michigan, made of 8 layers, with a clear coat over Black Walnut, Ash, Hickory, Birch, Red Oak, Mahogany, Cherry, and Maple. We are looking forward to creating one of our unique products for you!